What happens when play disappears from our cities? In a report for the National Trust, Stephen Moss writes, “a potential impact is that children who don’t take risks become adults who don’t take risks”. One response is the Playable City movement. It defines a Playable City as “a city where people, hospitality and openness are key, enabling its residents and visitors to reconfigure and rewrite its services, places and story”. It’s a movement that started in Bristol, and believes that “by encouraging public activities that actively bring joy, we can create a happier, more cohesive urban future”. The idea has since spread around the world to cities including Tokyo, Seoul, Lagos and Austin. I spoke to Hilary O’Shaughnessy, Producer for Playable City, who leads on the delivery of Playable City projects, based at the Watershed in Bristol. I started by asking her what is a Playable City? “For us a Playable City is specifically a human-led response to challenges for cities that are using technology in a way that connects people to each other. So Playable City was a reaction to Smart City narratives, which have changed a lot from when we started but at the time they were very cold and very, “Well, technology will solve everything and you’re either on board, or you’re not, so get out of the way”. We find that that’s not really a great way to understand the world or change anything or move forward. Especially because the community we’re embedded in sees technology as something that we can really use to bring people together and come up with better solutions for how we live, better ways of living together and that there doesn’t have to be a human cost to technological development. We can find a way for it to be organic and fruitful, and involve everyone. So what we do as part of that is we commission lots of work. It started in Bristol but now we do it internationally – I’m just back from Tokyo. We’re doing a lot of work in Japan at the moment – commissioning artists to come up with projects that set this thinking in motion. We’re trying to involve everyone, putting projects on the street in front of people that help them to talk about technology and change in cities, but doing it in a really playful, fun way that invites people in, rather than asks them to have some previous knowledge or understanding about something that’s not their expertise and therefore intentionally, or unintentionally, alienates them. Hilary O’Shaughnessy. Photo credit: Mutek. We want to invite people in and we find play is a really good way to do that because everyone has this ability to be playful. Play also doesn’t have to be language-based. You can use your body. So it’s an invitation for people to have different conversations about technology in cities. Are there examples of your favourite Playable Cities projects that you’ve seen that you could share? One of our projects that we had recently in Austin, Texas is an older project called Shadowing. This is by a group called Chomko and Rosier. We commissioned this project about four years ago. Basically what happens with Shadowing is we replace the technology in street lamps. For the person on the street, they’re walking and they walk underneath a regular streetlamp, and it records their shadow and plays it back for them. As soon as they realise this, they start to go, “Oh, I can manipulate this and I can… What is this?” And they become curious and they start to move differently. They might invite their friends to look at it. 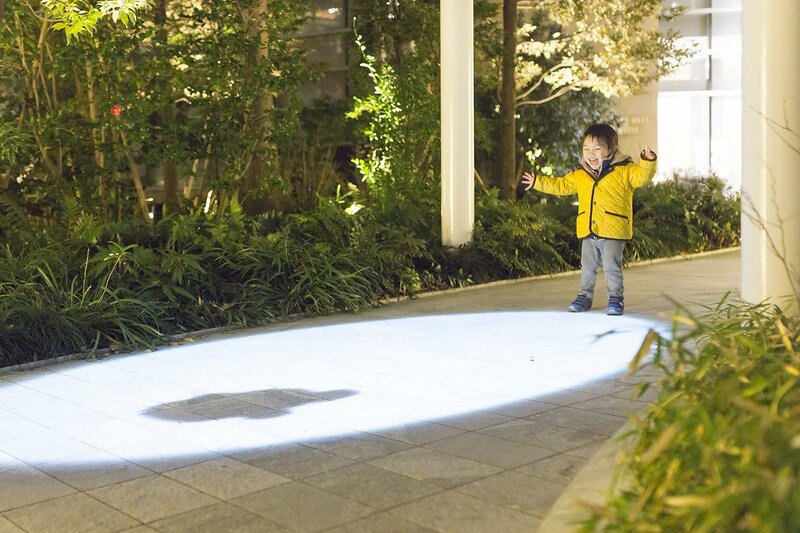 They just become very curious about this strange intervention in the street which is very fleeting and that’s an example of how quite a complex technological project can have a really simple effect, simple impact on the street. Then it extended from that. People start to ask how does it work, why does it work, why are we doing this in the city? Why should we do this in cities? Cities go, “Oh, so people are now excited about lighting in cities. We didn’t think they would be. We tried to ask them about it and they say go away.” There’s all these extended benefits to having something really simple and playful and lovely in the street. We’ve toured that a lot around the world and we find it’s always the same impact. It’s really nice to see people’s reactions to it. For us it’s always important that it’s an invitation. It still works as a lamppost. You can still walk through and ignore it if you want. So it’s always just nudging. We’re nudging people a little bit, going, “What if things were slightly different? What would happen now with this moment? Have a moment to think with us about that.” It’s a doorway to a different conversation. Is technology always an essential part of a Playable City, do you think? Do you also do things that are more analogue play interventions? We have, and we haven’t. We’re very interested in technology’s role in the world in the studio, and it is born of the studio so we’re very interested in where technology is going. Any city development at the moment seems to involve technology so inevitably we do end up talking about technology. For example in Tokyo at the moment we are going very much back to basics and not using any technology right now. Really trying to discover how people in Japan, in Tokyo – not how we can nudge behaviour, that’s a very specific term – but how we can invite people to behave differently in public space, and we’re doing it in very analogue ways with coloured tape on the floor and trying to just really understand. So we see the value of both. A lot of our work does involve technology but we’re not interested in the technology, we’re interested in what the technology does. So loads of our work, loads of our research, we prototype a lot, is without technology because it’s the same principle of getting people to look at things differently, or feel like they have a right to look at things differently and say that they have an opinion about it. Why does it matter that we create space for play in the lives of our cities? Why is it important? We can’t be expected to live our lives together without room for everything other than commercial interests. You know? We’re not robots. We’re humans. We’re not just data points gathering data and churning it out for some profit. If we are, what’s the point of that? We need to find better ways to live with each other. Even finding solutions to live better as data points has to be done with each other. As our cities develop and we’re becoming more separated from one another, so play is a way of bringing people to just remind each other that we are living in the same world together. We can’t escape from each other. There’s no solution that will allow us to move away from each other as humans. And that that’s not what we need, actually. That’s not how we function best. The problem is people are just making decisions based on finance all the time, and that’s having adverse effects on us. On our environments. Kids aren’t playing in the street. Adults aren’t talking to each other. It’s really important for us to remember our role as humans in the world. I came to Bristol a few months ago to visit one of the streets that were doing Playing Out, where they block the street so kids can play. They were talking about how Bristol City Council had created a sort of policy framework, I suppose, that made it really much more straightforward. If you wanted to shut your street, it was a really clear simple process. It didn’t take months and months. It was an understood process. I wonder what enabling policy infrastructures can help a city to become more playful? If you were the Mayor of Bristol, and you wanted to maximise its playfulness, what else you might do? Playing Out is a really, really good example of an initiative that was able to be distributable afterwards. Started as a good idea but didn’t just stay with that one person. They found a model to share it. We have had incredible success with Bristol City Council, with people being really open minded. A lot of the time the barriers that they face, and we face, are their own structures. Giving people more freedom within councils to make these micro decisions to test things out. I mean, nobody’s saying, “Give us the whole city. Shut down traffic and everything for a month we so can try something out.” We’re never asking that. We’re saying, “Give us this road for a day. Give us this corner for half a day. Give us this lamppost for six weeks.” Allowing people to try those smaller tests constantly will allow this environment of experimentation which will have a bigger cumulative effect but it will also I think allow people at the council to be more reactive to things. Because a lot of the time they want to do things too, and they can’t because it has to be this huge project, or nothing. Maybe a little bit of leeway in smaller things might pay dividends. To take that question up a level, there’s a question I’ve asked everybody that I’ve interviewed doing this book which has been, if you had been elected in the last election as the Prime Minister, and you had run on a platform of ‘Make Britain Imaginative Again’ – so you recognise that the imagination isn’t as strong as it needs to be at this time, and that rather than creating a National Innovation Strategy, which most governments do and which basically is just, “How do we make business as usual more effective” you thought actually what we need is a National Imagination Strategy that looked at education, and a whole range of different things – if you were running on that idea of ‘Make Britain Imaginative Again’, what might you do in your first 100 days as Prime Minster Hilary? That question makes me want to run away, but do you know what I did think just as you were saying that there? I was thinking about things like the Olympics. So we’re doing some work to build up to the Tokyo 2020 Olympics. And with those big sports events, it’s seeing the effect they have on smaller communities. Like how when Wimbledon is on you see more kids playing tennis on the street, or you will see kids playing football, or when the Olympics is on more sport centres became engaged. It’s trying to give everyone the confidence to know that they’re imaginative, or sporty, or whatever. Yes there are people who are brilliant at it, and they are the leaders, and there are people who will always be in the football team, but it’s giving everybody an opportunity to take part in that collective imagineering, or whatever that is. In the same way that everybody can go play football, it doesn’t mean you have to be a professional footballer. It’s opening up that opportunity for people to take part at all levels. Because as well with imagination, we go, “Oh, artists” and we don’t think, “well the artists don’t have the sole privilege for imagination”. Everyone has it. Every single person, and we need to give people more opportunity to express that, and show that. In terms of when we’re in a time of austerity and this narrative that there’s no money for anything that shuts down so much possibility and creativity, how do you sell the idea of Playable Cities to decision makers and politicians? Is there a narrative around public health, around social connection? If I’m the Mayor of a city who hasn’t got into this idea before, what’s in it for me? So it allows for these conversations about city change and potential for city change that are less heated because they’re abstracted slightly. We bring different people into the conversation. Everywhere we go we try to create a new community, or not create a new community, but bring together people in that city who are already doing those things, so that when we leave it’s sustainable. We’re not coming in and saying, “We have the answer and now we’re going away with our bag of tools.” We go in and go, “We’ve done this. These are the processes we use. We believe that you have those things in your city as well. Of course you do. So we’re going to stir this up a little and see what happens.” And now you have the people there who can carry this on when we leave. We bring in a big mix. And you’d be surprised how isolated, how thriving, amazing cities you go to, and loads of people, we get them together in a room, and they go, “Oh, well, our business people haven’t spoken to artist communities” and they’re three feet away from each other in buildings. But no-one’s ever invited them to mix and talk. Because they think they have no value for each other. I think a lot of what we do is just bringing those people together, and cities see the value of that, I think for sure. You mentioned before about how there’s less playing in the streets. When we lose that visible play in a city, what do we lose? I don’t know what the words are really, not signifiers – but just letting people know it’s possible. We forget that we have to constantly remind ourselves that things are possible. Because we take it for granted and then we forget them. It just gets ebbed away. If you stop swimming today and somebody doesn’t see you swimming, and we don’t talk about swimming, then people aren’t like, “Oh, we should go swimming”. It’s important to visibly remind people that these things are okay, because we’re constantly being reminded of everything else. We’re constantly being reminded that we should shop and we should exercise and we should eat well and we should – you know, and some of those things are really good – but we need to be reminded that it’s okay to do these things as well. To be humans. And that it shouldn’t be confined to certain times and places. Title photo credit: British Council Japan.